Clare has ample lakes, coasts and rivers that are ideal for fishing, making it a haven for fishing breaks and trips. Fishing Adventures specifically runs Sea fishing Trips in Clare and as a result of our enthusiasm for the sport, we have accumulated a wealth of knowledge specific to Clare fishing. In our post below we cover sea fishing, shore fishing, lake fishing and river fishing in Clare. What you want to catch will determine the type of fishing you are going to participate in. Owing to having some of the richest waters in Ireland and Europe, and by having a large range of species, Clare is renowned for sea fishing. Mackerel are abundant from April until November and apart from mackerel as a great fish for the table, they are excellent bait for larger species, including white fish, bottom feeders, conger eels, and sharks. Sharks are also plentiful during the summer months, with a range of sixgill, blue, porbeagle, tope, spurdog, skate, ray, and dogfish. Most of these sharks can be caught only 3-4 nautical miles from fishing adventures harbour, Kilbaha, Co. Clare and are some of the largest species in Ireland. The record breaking catch was a 12ft 9in long, bluntnose sixgill shark, weighing 1,056lb caught by the Clare Dragoon close to Loop Head. Shark is not the only species of fish available to catch while sea fishing in Clare. Depending on the season mackerel, pollock, flounder, turbot, cod, ling, wrasse, gurnard, conger eel, skate and tope are just some of the other species available, depending on what species the angler want’s to target. While some of these species of fish are regularly caught on fishing trips ,some others take a little more time, expertise, and paitence to hook. There are also a variety of exotic species that visit the coast of Ireland from time to time including trigger fish, tuna and bream. Kilkee Pier, on the north side of the main beach, is an ideal location for a spot of angling with Fishing Adventures. Ease of access and proximity to the town of Kilkee means there are no problems with parking or amenities. It’s the perfect place for holiday anglers. You can spin for mackerel and pollock at high tide and at low tide bottom fishing for flatfish or bass using fish bait or lugworms. Beyond the pier there are plenty of rocky formations and inlets where locals like to fish for conger eels and sink lobster pots. Past the golf club and all the way along as far as the headland, George’s head. On the opposite side of Kilkee bay, the south side of the beach, there is another angling mark. Flounder and Bass can be caught in this area. Further along the coast road there is a freshwater stream at Edmond’s point, which in the flooding tide is an ideal for pollock fishing using lugworm or fish bait. At the end of the coast road the is a collection of rock pools affectionately known as the Pollock Holes. There is a car park and a cafe here making for a very comfortable fishing experience although be advised at peak times the places is thronged with children and families swimming and relaxing in and around the rock pools. As a side note there is a statue in tribute to the late Richard Harris, the famous actor from the nearby city of Limerick. He spent his summers fishing in Kilkee and had a holiday home along the coast road which is marked with a plaque in his memory. 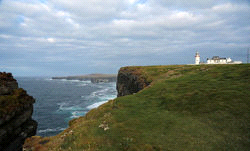 Loop Head (Irish: Ceann Léime, meaning “leap head”) is a headland on the north side of the mouth of the River Shannon, in County Clare in the west of Ireland. Loop Head is marked by a prominent lighthouse. The opposite headland on the south side of the Shannon is Kerry Head. The Shannon Foynes Port Company controls navigation in the Shannon estuary and river. Loop Head peninsula, has the Atlantic Ocean on one side and the Shannon Estuary on the other, with barely a mile of land saving it from island status. In 2010, the Loop Head peninsula was awarded a European Destinations of Excellence Award, which is an EU accolade for emerging tourism destinations which are developing in a responsible and sustainable manner. In 2013, Loop Head was named the “Best Place to Holiday in Ireland” by The Irish Times. Kilbaha, the last village on the Loop Head peninsula, is tucked into a sheltered bay at the western edge of the Shannon Estuary. Kilbaha pier was built in the early 19th century to cater for the large numbers of people making their living from fishing, seaweed gathering and piloting the ships going up the Shannon to Limerick docks. It was also used by cargo vessels bringing supplies to Loop Head Lighthouse, west of the village and on the tip of the Loop Head Peninsula. Kilbaha is the home of the Little Ark which you can visit at Star of the Sea Church in the village. Sea Angling 2015 has been a good season overall with some great fishing, and I met a lot of very interesting people. Lot’s of fine whitefish about including pollock, whiting, ling, haddock etc and some lovely double figure cod. Even though the weather wasn’t always ideal summer weather we almost always managed to go fishing with very few cancellations, and of course we had some memorable day’s at sea. When it was a bit too windy for the Atlantic we anchored in the Shannon estuary and fished for ray, bulhuss, conger, dogfish etc which can be very relaxing. Blue shark and tope were plentiful as well this year and a lot of fun to be had with some fine spurdog’s. Fishing Adventures is part of the tag and release program so all sharks are released unharmed. The Lady Gwen ll has spent her first season fishing off the Loop Head Peninsula and has passed with flying colours. She will be undergoing a few upgrades for next season to make her even better and more enjoyable to fish from.